Team GB is not the only team at the 2012 London Olympics enjoying dazzling success. Kazakhstan, a former Soviet state, has won six gold medals so far - more than its giant neighbour and former ruler, Russia. While Moscow has been mulling a poor first week at the Olympics - with just five gold medals * - Kazakhstan has been celebrating a golden Games. Kazakh fans have already been celebrating the unprecedented success of their sporting heroes. From two gold medals at the Beijing games to six after just one week in London, no wonder supporters have been ecstatic. 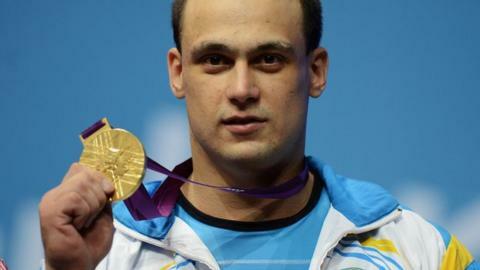 Hundreds were gathered in the crowded arrivals hall of Almaty airport with Kazakh flags and banners on Monday evening to welcome double Olympic weightlifting champion, Ilya Ilyin, who retained gold in the 94kg in London, the BBC's Shodiyor Eshaev reported. The plane from London was late, but that didn't dampen spirits. "We feel great because we are patriots," Agadil Urunbasarov, who had brought his young family along despite the late hour, told the BBC. "I came here with my wife and young son. We both want our son to become as strong as Ilyin," he said, adding a heartfelt: "Victory for Kazakhstan!" The Kazakh media have been fuelling the public mood of celebration. Kazakhstan's main television channel broadcast Ilyin's homecoming live. The country's latest gold medal winner promised to achieve even more. "I will be busy learning a language, I want to learn English," he told his audience. "I'll dedicate six months to this. And then I will scale even bigger heights. I will definitely stay in the sport." He also said that Kazakhstan's traditional diet had fuelled his success, referring to the country's favoured horsemeat sausages, known as 'kazy'. There had been media stories about the Kazakh squad's plans to import the cherished speciality to London to aid the athletes performances. The mood north of the border has been less joyous. Russia has traditionally been one of the superpowers of world sport. The Soviet Union regularly topped the Olympic standings, and the Russian Federation has never been outside the top three at the summer Olympics. In Beijing in 2008, it won 23 gold medals, which was its lowest tally ever. Take Yelena Isinbayeva, Russia's former gold medal winner in the pole vault. After failing to defend her title, she told the BBC: "The weather conditions last night were the worst you can imagine for the pole vault - wind and rain. It was really difficult to, as we call it, catch the wind. Plus, perhaps, I wasn't as determined to win as I should've been." The disappointments in London may be the start of a worrying trend for Russian sport. The country also had a torrid time at the 2010 Winter Olympic Games in Vancouver, when the team returned with just three gold medals, and finished 11th in the medal table. This is particularly foreboding considering Russia hosts the Winter Olympics in Sochi in 2014. Russian state TV has been trying to put a brave face on the first week of competition in London. On 5 August, a correspondent for main official channel Rossiya 1 told viewers that in the "unofficial" ranking of total medals won, Russia was in fourth place with more than 30 medals, though he admitted the vast majority were silver and bronze. The same bulletin dwelt at length on Russia's successes earlier in the week in judo, where it landed three gold medals. The presenter said it was the first time in the "whole history of the Olympics" a country had achieved this. Judo is, of course, the favourite sport of President Vladimir Putin, who went to watch some of the Russian judokas during the London Olympics and embraced one of the winning judokas. But the judo gold medals were isolated triumphs for the Russian team. On 5 August, sports minister Vitaliy Mutko was already speaking about the "very tough conclusions" that would have to drawn in relation to some sports. Mutko said that overall the Russian team was performing "in the range of the performance in Beijing", but there had been some major disappointments, notably in fencing and shooting. Heads have already begun to roll. The chief coach of the fencing team, Vladislav Pavlovich, has handed in his resignation, and shooting coach Igor Zolotarev said he will follow suit. Russian commentators, though, think the reasons for the low gold count are more deep-seated and systematic than Mutko is suggesting. Olga Yermolina, sports correspondent for liberal daily Moskovskiye Novosti, said it was a general "inattention to detail" that had led to the "lamentable results". The US swimming team had five times the number of accredited specialists as the Russian swimming team and had vastly superior massage facilities. As far as Russian blogger Anton Nosik is concerned, the buck for these oversights should stop with Mutko. Will Vladimir Putin be as happy when the athletes return to Russia? Nosik wrote that the situation at London 2012 could be summed up in two words: "Vancouver revisited". He said Mutko had promised to resign after the sporting debacle there, but that two years later "the same people that they 'forgot' to hold accountable for Vancouver are now responsible for London". Mutko is hopeful the second week of competition will bring Russia a more fruitful Olympic harvest. He also said that he hadn't given up hope of overtaking Team GB and finishing third in the medal table. But Aleksey Lebedev, head of the sports section of popular daily Moskovskiy Komsomolets, thinks Mutko's talk of "very tough conclusions" will be counter-productive and will "harm" the athletes yet to compete. They are under a "tremendous burden of responsibility", he wrote in a front page article on 5 August. "And now after this 'pep talk' in the Soviet party spirit, this will only be worse." * Russia won two more gold medals on Tuesday in the men's high jump and 3m springboard.